Hello my people. I hope you are all doing well. We got snow here where I live so we are just trying to stay warm. I must say, I am liking the snow so far but I probably won't be saying that when it is still here in March. Some might live for Him in private because they are scared, others are embarrassed. But, was Jesus scared and embarrassed to show His love for you? People might hate on you or make fun of you but they are missing out on what you have. You are living for a Saviour who died for you so that you don't have to go to hell but instead go to Heaven. They are living for themselves and themselves only. 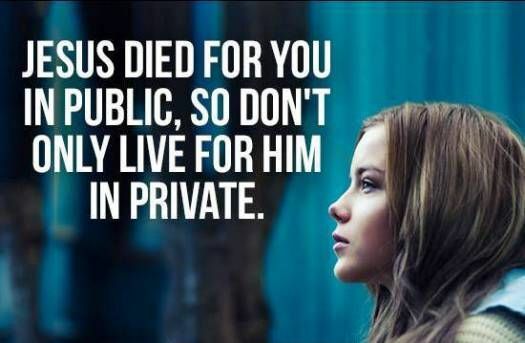 So don't be scared to share about Jesus. Don't be scared to work for Him. Making God happy and proud of you means much more than getting praise from others because they can't give you what God gives you. Jesus wasn't always popular when He was on earth so there will be no difference when we do. The Christian life isn't about gaining followers. It is about living for our Father in Heaven. It is about praising Him for what He has done. It is about always striving to be like Jesus. It is about being His child and obeying His will which includes telling others about Him. So share your faith boldly. Not yelling, but meaning all what you say and stand by it. God bless you all and keep living for Jesus! Awesome reminder about living openly for Jesus! :) It's so easy to just kinda live in the shadows sometimes and avoid making our faith and open thing. Interesting note: my cousin that just got married in Vermont was out for dinner on her honeymoon. And the couple sitting at the table next to them (whom they didn't know) paid for their meal secretly and left them a note commending them for praying for their meal in a public place. :) God definitely blesses us for being bold Christians! Stories like that are awesome to hear about. Even something as simple as praying in public touches people.